I wish I could stand here today and tell you that Sunday church is a place of safety, a kind of shelter from the storms of the world, an hour when we can close those doors and shut out the sometimes horrific things we human beings do to each other, or a place where we can forget about the suffering that bad luck or just being in the wrong place at the wrong time can bring. I wish I could tell you that grace of God and these four walls and this beloved community could protect us from the destruction rained down in Paris, or from the funeral last Tuesday of a 9-year-old boy targeted in an alley in Englewood, or the random shooting of a beautiful young woman from Evanston, or even from the more everyday sorrows of cancer or disability or grief. I wish I could tell you that being good, and following Jesus, and saving plenty of money for retirement and living in a nice community and being a responsible citizen could guarantee that nothing bad will happen to you and will keep your children safe. I wish I could tell you that because I’m your pastor, and I love you, and want the best for you, and I want all that for myself and my family as well. But I can’t tell you any of that, because I'm your pastor and I love you, and because we all know it’s not true, and I wonder if that’s one of the reasons we come here on Sunday. I know it’s not true because a few years ago I visited a neighborhood in Syria called Yarmouk in Damascus, bustling with blocks and blocks of low rise apartments and shops, and full of beautiful, kind, hospitable, cultured people, eager to become friends and to make peace together. I know that neighborhood now to be a smoking ruin, completely destroyed in a suicidal civil war. I know it’s not true because of a 45-year-old friend of mine, a handsome, funny, thoughtful and exceedingly kind person, a man devoted to his partner, who has always done good work, and is a model citizen, and was diagnosed with cancer not two months ago, and is now in hospice and hopes he might make it to Thanksgiving. I know I’m not the only one who can give examples like that, who can testify that life isn’t safe, and that being good and going to church and believing in God don’t guarantee protection from any of the dangers of the world. But even if I could get up here and lie to you, and tell you everything will always be OK, these three readings today would expose me immediately. All three of these scriptures were written for days like to today, for times like these, and for people like us, when the world seems to have gone completely mad, and the faithful are wondering just what God is up to, if anything. The gospel makes it sound like Jesus is foreseeing the Temple’s destruction, but the community of the gospel writer, 30 years later, has already heard the news: Jerusalem is a smoking ruin, just like my Syrian neighborhood, razed to the ground by an earlier group of thugs in a breathtaking assault meant to inspire terror all around. Daniel’s community, just 200 years earlier, was reeling from the tyrannical rule of the Greek empire that preceded the Roman one, complete with the unrelenting desecration of the Temple and the abuse of human beings that would shame even ISIS. And the preacher of the long sermon we call the letter to the Hebrews, which we’ve been reading from these past weeks, decades after Mark, is pleading with her beleaguered community, whose members are about to throw in the towel, because, despite the resurrection, nothing has really changed. The Temple is destroyed, Israel’s hopes are dashed, and the Christian community itself is now under threat. All these believers are asking the same thing: What’s the plan? How is God going to rescue us? When is Jesus going to come back and fulfill his promise? When is all this going to be over? And Jesus really isn’t much help: It’s just going to get worse, he says. “These are just the birth pangs.” So don’t expect him to parachute in anytime soon. So is there any good news to be had? Anything helpful at all? Of all the places we could look, it’s the writer of Hebrews, one of the weirdest books of the New Testament as far as I’m concerned, who finally at the end of her long sermon gives the best counsel. It boils down to something like: Remember your baptism and keep coming to church. In other words, don’t give up on being Christian. Remember your baptism: For us, perhaps, it means a constant return to the baptismal covenant we all renewed just two weeks ago at Grace LaRosa’s baptism. It means remaining faithful to this fellowship, this Sunday gathering, to coming here week after week for a taste, in the words of the Bible and the sacrament of the Eucharist, a taste of the world that God wants for all of us. 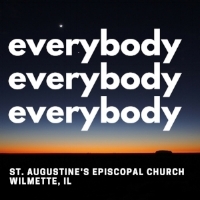 It means resisting evil, whether in the form of grotesque violence, or in the hidden fears and hatreds that feed it, which are alive and active here in Wilmette every bit as much as they are in Chicago, or Paris, or Syria, or anywhere there are human beings living together. It means proclaiming in word and example the Good News of how God is transforming the world, of how in Christ God has changed even death into life. It means serving Christ in all persons—all persons, everybody, everybody, everybody, no matter where they are from or how they got here, or how they worship God or even if they do, or if we agree with them or even if we like them. It means striving every day, striving in the ways that God provides to us, for justice and peace, and for the dignity of every human being. Finally, the preacher to the Hebrews says, we must “provoke” each other to these good things, not let each other become discouraged and overwhelmed, even to get after each other when we do. Christian life, after all, is a marathon, not a sprint, and sometimes we just have to gut it out. Because God really does have a rescue plan for the world, a path to the new creation God wants for us. The thing is: We’re it. It’s us, it’s the church, at least in part, the continuing presence and power of Christ in the world, God’s community of first responders and relief workers, reconcilers, healers and peacemakers, even provocateurs, whom God has called in Christ to take part in the renewal of the world. And it’s through the everyday bits and pieces of faithful living that God is bringing forth God’s dream for creation. None of this, of course, will keep us safe, or comfortable, and in fact it may be both dangerous and challenging, but it sure seems to me something worth living for, and maybe even dying for.